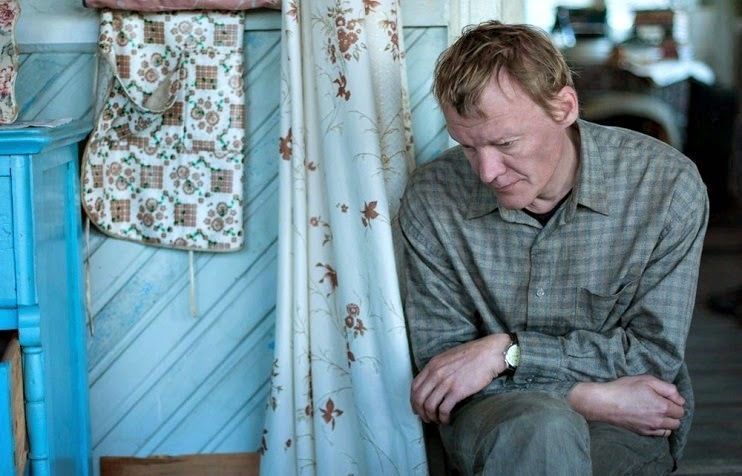 Sergei Serebryakov plays the tormented center of Andrey Zvyagintsev's "Leviathan." The opening shots of the film start with long, still shots of an impassive-looking landscape. Cut to a road, wandering bewildered toward a village in the distance, a power line looping along beside it. Cut to rotting hulks half-submerged in the water. “Leviathan” is a visual poem that enwraps a Job-like narrative of dispossession and hypocrisy. Gossip first. It’s easy to see why most of the big shots in Russia didn’t like “Leviathan.” It makes Russia’s Church and State, the twin props and guiding purpose of Putin, look like Hammer-horror Twins of Evil, bent on crushing opponents with a sense of being divinely entitled to do so. Russia’s Ministry of Culture funded 35 percent of this production. The conservative political over this film, which termed it anti-Russian and unpatriotic, means that the Ministry will now impose more restrictive guidelines for funding future projects, ones that will not “defile” the national culture. Zvyagintsev’s film is a stately examination of life in modern times that might be staged in any country where power, influence, and money make things happen. A corrupt mayor in the distant rural province of Murmansk seeks the ramshackle, ancestral home of a cranky independent handyman. The handyman’s old Army buddy, now an up-and-coming Moscow lawyer, comes to assist him. As tempers flare, the stakes rise and eminent domain is declared. The conflict spirals out of control, as individual flaws serve as tripwires for the destruction of lives. However, this is no cynical sermon – it digs much deeper. No character is allowed less than a three-dimensional presentation, making sympathies had to place. The clear delineation and development of character here gives the film a novelistic feel. Everyone carries the seeds of destruction here, all the way down to the handyman’s rebellious teenage son. A clergyman endorses ruthlessness. Friends betray friends. The problem isn’t political – it’s personal. The cognitive dissonance is deafening. “Leviathan” is unwelcome to some because it is tragic. But its searing, observant honesty, rigorous construction, and luminous compositions give it the feel of a classic. Russia is now going through what American artists experienced during the late 1980s, when the National Endowment for the Arts was politicized. Or in the 1950s, during America’s Second Red Scare. Or Soviets under Stalin . . . Censorship we will always have with us. Fortunately, “Leviathan” got out before that particular barn door was closed.